Approval flows define the expense authorisation hierarchy. Apply approval flows to projects, departments and users. 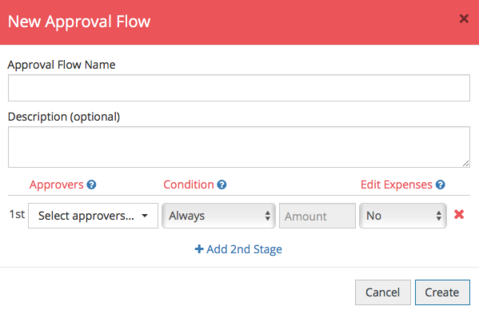 In order to create your approval flows, you will need to add your approvers as users to your account first. 1. From the Admin, click on Approval Flows. 2. Click the New Approval Flow button. 3. You should give your approval flow a name. You can also add an optional description for that approval flow. 4. You can assign approvers to the approval flow stages. Alternatively, you can select multiple approvers at the same stage to create a "pool" of approvers. Always - Expenses will always go to this approver. Amount Exceeds - Expenses will only be sent to this approver if the expense exceeds a certain amount. Amount Under - Expenses will only be sent to this approver if the expense is under a certain amount. Outside Policy - Expenses will only go to this approver if the expense is outside of company policy. 6. 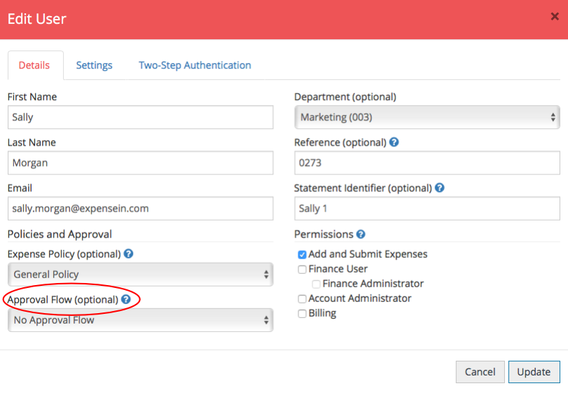 You have the option to allow the approver to edit expenses in the approval process. Please note, the ability to edit expenses during the approval process is only available via the web portal. Once you're happy, click Create to add that approval flow to your account. Now that you have created your approval flow(s), you will need to assign this to your users. 1. In Admin, navigate to the Users section. 2. Choose the users that belong to the approval flow you are assigning by selecting them (tick the box next to their name). 3. Click the Actions button and select Change Approval Flow. 4. Select the approval flow you wish to assign from the dropdown list. Alternatively, you can individually click Edit next to your user's profiles and select the approval flow there. You also have the ability to assign approval flows to projects and departments.